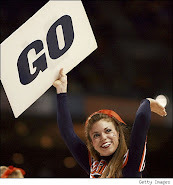 #25 N.C. STATE 69, UConn (Huskies, 22,301 students, Storrs, CT) 65 - You’re N.C. State and it’s the Jimmy V Classic. You gotta win. No pressure. Richard Howell had 13 points and grabbed all 10 of his rebounds in the second half, and C.J. Leslie had 16 points and 13 rebounds to lead No. 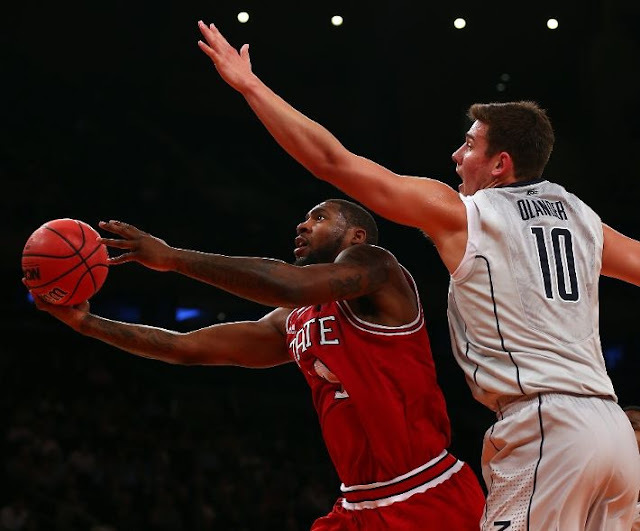 25 North Carolina State to a 69-65 victory over Connecticut in the second game of the Jimmy V Classic on Tuesday night at Madison Square Garden. Howell, a 6-foot-8, 257-pound senior, led North Carolina State's second-half rush to the boards. The Wolfpack (5-2) had 20 rebounds in the second half, 11 on the offensive end and Howell grabbed seven of those. The Huskies had 13 rebounds in the second half, six offensive. Shabazz Napier led the Huskies (6-2) with 19 points and Ryan Boatright added 18. Georgia (Bulldogs, 33,367 students, Athens, GA) 62, GEORGIA TECH 54 - Freshman Marcus Georges-Hunt scored a career-high 18 points and Georgia Tech never trailed while beating Georgia 62-54 on Tuesday night. Mfon Udofia added 12 points for Georgia Tech, including a three-point play with about 1 minute remaining after Georgia cut the Yellow Jackets' lead to 55-50. 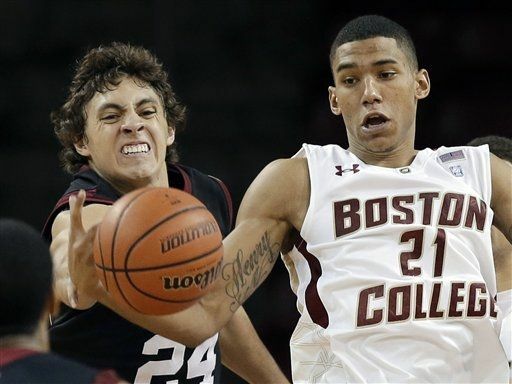 Harvard (Brainiacs, 7,181 students, Cambridge, MA) 79, BOSTON COLLEGE 63 - Sophomore Ryan Anderson scored a game-high 23 points to go with seven rebounds, but Boston College lost to Harvard, 79-63, in front of 3,128 fans at Conte Forum on Tuesday night. Anderson went 11-for-12 from the field and set a career high for field goals made. It was his third game this season with 20 or more points. Freshman Joe Rahon led all players with a career-high eight assists to go along with 12 points and sophomore Lonnie Jackson recorded 11 points for the Eagles. Anderson notched BC's first six points and 11 of the first 14 as the two teams opened the contest tied, 14-14, eight minutes in. Anderson went 5-for-5 from the floor during that stretch, with a three-point play from Rahon accounting for BC's only other points. The Crimson then used a 9-0 run to claim a 23-14 edge at the 7:23 mark.